Boundary analysis techniques which are analytic signal, total horizontal derivative (THDR), theta map, tilt angle, hyperbolic of tilt angle (HTA), normalized total horizontal gradient (TDX) and normalized horizontal derivative (NTHD), play an important role in interpreting potential field data. In this study, an enhanced total horizontal derivative of the tilt angle (ETHDR) method was utilized for comparison of results with the other edge detection filters. The sufficiency of the ETHDR method is indicated using theoretical models and field study. Compared with the formal methods, the ETHDR filter more detailed outcomes for buried models and is less sensitive to noise. Aeromagnetic anomaly of Bitlis Zagros Suture Zone (BZSZ) and its surroundings was used for field data. The eastern part of Turkey which has major tectonic structures such as East Anatolian Fault (EAF), Malatya Fault (MF) and Bitlis-Zagros Suture Zone (BZSZ), with the effect of Arabian Plate’s northward motion, Anatolian block and Northeastern Anatolian Block escape to west and east, respectively. In the first stage field study, the discontinuities were not found recognizable in the results of boundary analysis methods. Then, pole reduction and upward continuation (5 km and 10 km) were applied to the aeromagnetic data for revealing the deeper effects on data. The same boundary analysis methods were applied to aeromagnetic data after pole reduction and upward continuation. The results were compared with each other and the anomalies were associated with the faults and previous studies. It is thought that there are tectonic boundaries that have not yet been identified geologically in the study area.
. M. Pilkington and P. Keating, Geologic applications of magnetic data and using enhancements for contact mapping, EGM international workshop Adding new value to electromagnetic, gravity and Magnetic methods for exploration, Capri, Italy, pp 11-14, 2010.
. F. Dogru, O. Pamukcu, and C. Pamukcu, Determination of Mine Location by Using Edge Detection Methods: A Case Study of Sivas-Divrigi. Science PG Earth Science, 5(4), 56-61, 2016.
. N. Bournas and H.A. Baker, Interpretation of magnetic anomalies using the horizontal gradient analytic signal, Annali di Geofisica, 44 (3), pp 506-526, 2001. ISNAD DOGRU, Fikret . "Revealing Tectonic Structure by Utilizing the Boundary Analysis Methods on Aeromagnetic Data of Bitlis Zagros Suture Zone and Its Surroundings, Turkey". 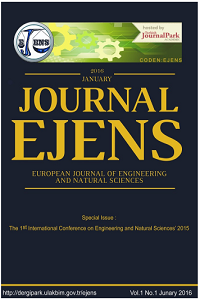 European Journal of Engineering and Natural Sciences 2 / 1 (February 2017): 37-48.